This cottage is one of the Irish VWT reserves. It is leased from the owners, who are full-time farmers. The habitats in the vicinity of this bat roost include unimproved pasture, scrub, watercourses, mature trees, hedgerows and stonewalls, and there is woodland within several kilometres. 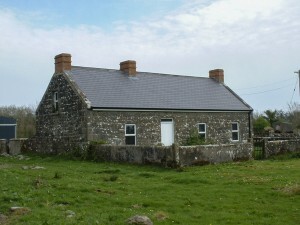 The bat colony using this stone building was discovered by the Trust during its intensive ‘door-to-door’ survey of uninhabited rural buildings in County Clare in the late 1990s. At that time the colony consisted of approximately 50 bats that used gaps in a ground floor window and a chimney by which to enter and leave the cottage. The bats are counted twice in June in the weeks leading up to the first births, as they emerge from the cottage after dusk, in keeping with the monitoring guidelines set by the National Parks and Wildlife Service. These counts provide an indication of the adult population using the roost from year to year. At Rylane Cottage, as at other sites with more than one exit or where shade renders it difficult to accurately record emerging bats, camcorders with infra red spotlights are used to record the animals as they fly away from the roost. In this way 299 bats were counted emerging from the cottage in June 2015. The lesser horseshoe bat is particularly vulnerable to disturbance and as a result it is not possible to allow public access to VWT roost sites. However, a small number of training courses are run at certain reserves during the winter months to enable ecologists, architects and local authority staff witness at first hand the practical measures that can be taken to help conserve this species. 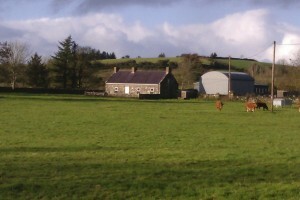 The farm at Rylane, including the bat cottage, has been used by Teagasc for its REPS farm training courses and also by independent farm planners and advisors. For more information on the lesser horseshoe bat and also Leisler’s bat, please go to our Species pages.